As with all of my previous introductory posts to GLutaMAX products, I won't be reviewing the GlutaMAX Lightening Anti-Perspirant and Deodorant just yet. I really do believe in honest reviews; so, for now, let me just introduce you to the deodorant. 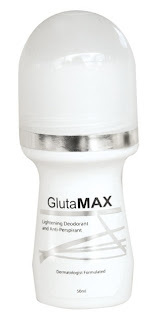 With regular use, the GlutaMAX deodorant promises whiter and smoother underarms. Thanks for sharing Angel. My sister is looking for a whitening deodorant and hindi ako maka recommend kasi wala pa naman ako nagamit. I'm using VMV skin saving essence and it's an anti-perspirant lang kasi. Will recommend this to her. Also enter my new giveaway! Everyone wins!